Street Feast have now moved on from Haggerston, but don't worry - they're back in Hartwell Street, Dalston, where they have feasted before, for both Fridays and Saturdays from 19th July for 9 weeks. Friday is 5pm - midnight, and Saturday is noon - midnight. Brilliant. 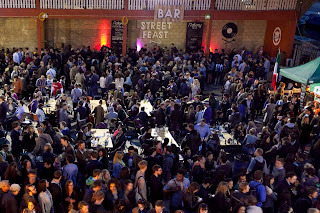 "Following last year’s success at Haggerston’s Merchant Yard, Street Feast is back with a new location, setting up their Street Food community in Dalston Yard for nine weeks over the summer, starting this Friday 19th June. Some of the capitals tastiest food stalls will set up camp in Dalston every Friday and Saturday until 14th September, creating a hub of great food and drink including Breddos Taccos' famous chilli back shot, Baba G’s spiced tandoori lamb and Vinn Goute’s octopus curry and parrot fish cakes. As well as top street food traders, this year will also feature a fresh juice bar (made with fruit and veg sourced that morning from Ridley Road market), as well as a brunch menu and coffee from Caffeine Canteen. Families can get involved with kid’s workshops going on throughout the summer, as well as cocktail classes and a Gin Lane for the adults. Former model and wine expert Ruth Spivey will be setting up shop with a selection of hand picked wines every Saturday as well as hosting a tasting table so you can try before you buy! A Mezzanine area will be available for private hire (think Keg parties and BBQs), as well as a program of top chefs and restaurants popping up in the Yard to bring together top quality food with a relaxed street feast atmosphere."